A real grand old lady from Slängsboda. She is a full sister to *Pemba (the dam of *Pepi leased to Sweden and *Pepton) and half sister to *Penitent by Partner. She has produced several broodmares, some exported to the US, and the stallion Poem. He was later gelded and became one of the best endurance horses in Sweden. Peonia belongs to the mare line of Szamrajowka, a mare born ca 1810 at Bialocerkiew. The line was lost after World War I but came back when the mare Kewa 1923 (Siglavi Bagdady-11 x Kalga) was imported from Inocenzdvor in Yugoslavia. It was lost again after World War II when Kewa and two of her daughters were taken to Tersk. It flourished in Kaukasus and during the 50ies two mares were bought to re-establish the line. They were the full sisters Prowierka and Piewica (Priboj x Wlodarka). Prowierka never had any impact on polish breeding but were the more important in the US. Her granddaughter *Prowizja was a famed showhorse who produced several champions by *Bask. Piewica, however, was another thing. She proved to be a most successful broodmare and is the dam of 5 mares (including Pika by *Bandos imp Sweden, the granddam of Porla) and one stallion, Ibn Bandos, before she was exported to Monaco. Her first daughter was Penza 1959 by Faher. 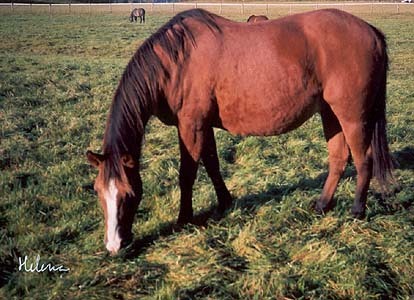 She was the dam of mares *Pemba, *Pensja and *Penelopa and the stallions *Pekin, *Pentagon and *Penitent. Another daughter of Piewica, Pentoda 1970 by *Bandos, was the grandmother of Pepesza 1993, dam of Polifonia 1999 imp Sweden.